Missi was a lovely black & white spotted girl. She was bred by ourselves from our very own Pebbles. Cibrith Cat-Kin J.W. x Cibirth Charles Angels At Lotsaspots J.W. Pebbles was a lovely black & white spotted girl. Also known as Cibrith Charlies Angel With Lotsaspots J.W. 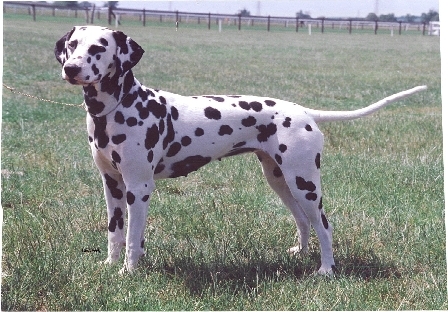 She was bred by our good friends Kathy & Keith Willis from the well known Cibrith Dalmatians. 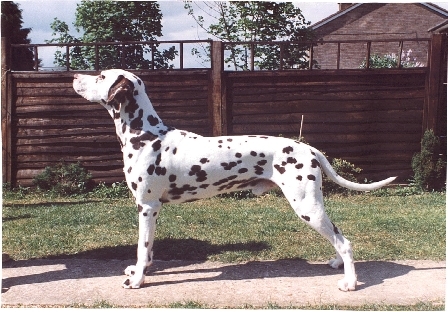 Rodney was a lovely liver and white spotted boy. He was also known as Lotsaspots Liver Luke. He was bred by us from Dino & Pebbles from our first ever litter in 1998. Sadly due to a really bad injury was put to sleep 25th April 2005. Dakata Dumpi Deano With Lotsaspots J.W. x Cibirth Charlies Angel With Lotsaspots J.W. Dino was a lovely liver and white spotted boy. He was also known as Dakata Dumpi Deano With Lotsaspots J.W. 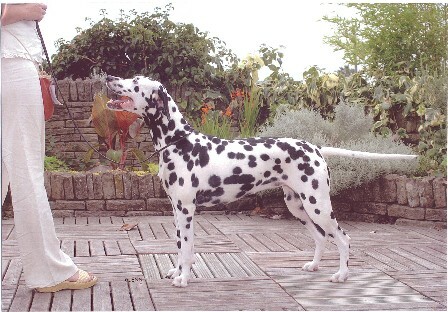 Dino's breeder was Theresa Gardinor from the well known Dakata Dalmatians.